With the aggressive campaigning to stop traditional cigarette use, e-cigarettes seemed like the perfect comprise. 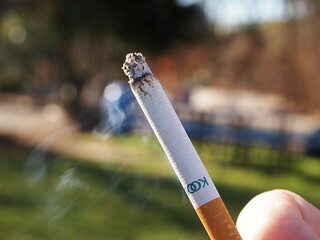 Cigarette smokers who wanted an alternative to smoking traditional cigarettes had finally found a product that did not subject others to that distinctive odor of cigarette smoke, cost much less than traditional cigarettes, eliminated the risk of fire, and potentially eliminated many of the health risks (stroke, heart attack, lung cancer, throat cancer, pneumonia, osteoporosis, Alzheimers). E-cigarettes also seemed to be more socially accepted by the public, and eliminated the issue of increasing restrictions on smoking. But while e-cigarettes may have many benefits over traditional smoking, new information released by the Centers for Disease Control and Prevention on Thursday claims that as the popularity for this new product has increased, so have calls to the poison control centers about exposure to liquid nicotine. In fact, the Centers for Disease Control and Prevention reports that in February alone there were 215 calls to the poison control centers about e-cigarettes. This is compared to one call per month in September of 2010. Thats a jump from 0.3 percent in September 2010 to 41.7 percent in February 2014. Experts also warn that there are many cases of ingestion which are not reported so the total number of poisonings could be even higher. Whats even more concerning is over 50% of the calls related to the ingestion of chemicals by children five years old and under. About 42 percent of the poison calls involved people age 20 and older. Should we be concerned? Although there has only been one reported death from liquid nicotine, and that person supposedly injected it, the side-effects of poisoning can be mild to serious. The CDC reports that children who ingest too much liquid nicotine, either absorbed through their skin or eyes, or inhaled, could have symptoms such as eye irritation, vomiting and nausea. The Centers for Disease Control and Prevention also believes the rise in poisonings makes it critical for people to monitor nicotine exposure through e-cigarette liquid and to understand the steps they need to take to prevent future poisonings. For instance, parents who decide to switch from traditional cigarettes to e-cigarettes should be aware that young children can be poisoned by liquid nicotine by ingesting, inhaling or absorbing the liquid through their skin or eyes, as opposed to eating a conventional cigarette. What does the CDC believe about e-cigarettes?